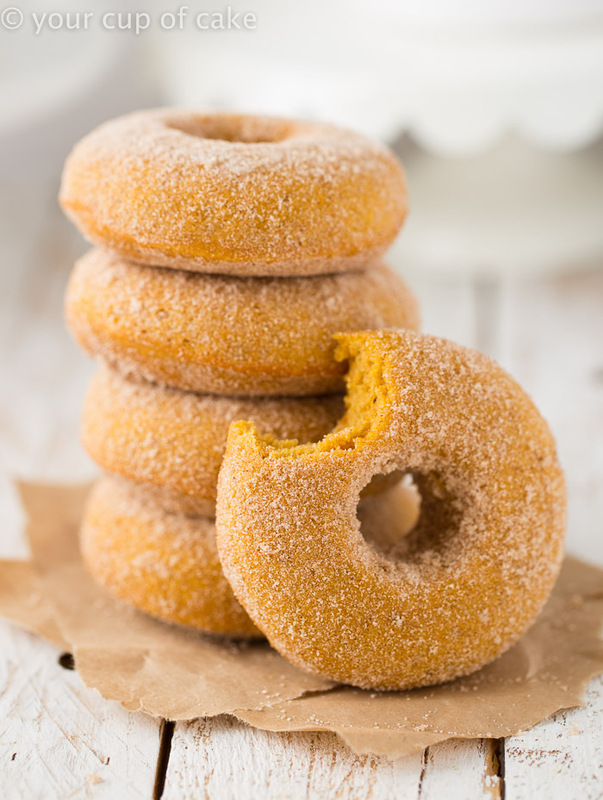 Baked Pumpkin Doughnuts with cinnamon sugar coating are the perfect treat for fall! This recipe is so good, it actually got me a date! That’s right, I made them for a party and a handsome boy said they were too good to be homemade, they had to be from a bakery. Then I told him I baked for a living and he believed that I really made them. Well okay, okay he hasn’t asked me out yet. But he did get my number and I’m crossing my fingers! I’ve made these doughnuts three times in the last two weeks, so I knew I had to post them! Not only did they get me an introduction to dapper young man but they’re also so good I ate nearly half of the first batch I ever made! Oops! You can dip these in a glaze or frost them with maple or cream cheese frosting but I liked the cinnamon sugar because it saved me a few calories 🙂 Plus, they just looked so perfect! You can even serve them with a scoop of ice cream and really make a decadent dessert out of it. I used this doughnut pan and I love it! baking doughnuts is so fun and everyone’s always shocked to learn that I actually made them when I show up with a plate stacked high of perfectly fluffy doughnuts. You can coat them in cinnamon sugar however you want, but I decided just to do it in a casserole dish, which meant using extra cinnamon-sugar. Yum… I could hardly keep away from these as they cooled. And I did sneak one… maybe two before the photo shoot. Really craving these and a big fuzzy blanket right about now. 1. Preheat oven to 360 degrees and grease doughnut pans. 2. Whisk together flour, baking powder, salt and pumpkin pie spice. 3. In a separate bowl, combine sugar, brown sugar, oil, eggs, pumpkin and vanilla extract. 4. Combine the wet and dry ingredients and stir. Don't over mix. 5. Fill doughnut pans 3/4 full (I used a piping bag to fill mine) and bake for 12-16 minutes or until an inserted toothpick of knife comes out clean. 6. Coat hot doughnuts in cinnamon-sugar mixture by either placing cinnamon-sugar in a bag with a hot doughnut and shake. 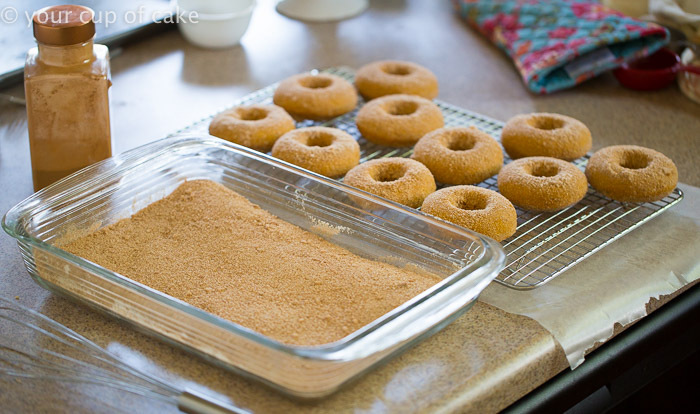 Or I doubled the amount of cinnamon sugar and put mine in a casserole pan and turned my doughnuts out of the pan into it and continued flipping the doughnuts until coated. 7. Let cool and keep on cookie racks! When I put mine in a tupperware the cinnamon sugar soaked up into the cake, so I kept mine on the countertop on cookie racks instead! Okay, now about this giveaway…. Because this week marks 5 years of blogging I’m giving away a 5 qt KitchenAid Stand Mixer to one of you lucky readers! As for color, you’ll have about 10 colors to pick from and if you win I’ll send you that list! 1. Comment on this blog post telling me which of my recipes you would first make with your fabulous KitchenAid mixer! Giveaway closes on October 20, 2015 at 11:59 midnight MDT. Must be 18 or older to enter and have a continental US mailing address. This giveaway is not associated with KitchenAid, Pinterest, Facebook or anyone but me. Because I’m paying for this gift as a small thank you to all your support! 🙂 Best of luck! The winner will be picked by a random number generator! I would make the wicked witch cupcakes! pinned skeleton cupcakes, those are adorable. I would make your Skeleton Cupcakes recipe first, with the fabulous KitchenAid mixer. Pinned the pumpkin coffee cake and made it. IT was delicious. pinned spinach artichoke dip, yummo!! Hey Lizzy! I love your strawberry lemonade cupcakes. Using the freeze dried strawberries in the frosting was such a hit with everyone who tried them. That’s what I would make if I won the mixer. I’m also pinning these donuts to make soon! They sound delish! Keep those fall recipes coming! I would make your: Pumpkin Coffee Cake recipe. The first thing…but definitely not the ONLY thing, that I would make with my fabulous new KitchenAid mixer…your thin mint cupcakes. http://www.yourcupofcake.com/2015/03/thin-mint-cupcakes-2.html. Yummy!!! The recipe I would make first with the KitchenAid mixer would be the Pumpkin Cream Cheese Bread! I love anything and everything PUMPKIN! I would make the oreo cupcakes first…. they are my favorite! Plus my current kitchenaid is leaking oil! I pinned the caramel apple cupcakes! I pinned the oreo cupcake recipe! I would have to make the Almond Joy cupcakes first. They are my husbands favorite candy bar! I pinned the red velvet 4th of july cupcakes! Haha, I totally have typos in this!! It is not an okay, they are fabulous! Love the blueberry pancake cupcakes!!! I pinned your homemade oreo recipe! I would make Pumpkin Oreo Cupcakes! I love all the pumpkin recipes, but I’ve never made donuts so Pumpkin Donuts would be the first thing I made with a Kitchen Aid. That would be awesome! If I won the amazing mixed I would make everything but I think I will start with the pumpkin cream cheese bread. That looks so good! I would make pumpkin coffee cake! Pinned caramel apple coffee cake! Pinned your Chocolate nutter butter cupcakes! pinned your reese’s peanut butter cupcakes! I totally forgot to mention the name of the recipe…lol. My first FB share was the Cute Garden Carrot Cupcakes. I would make these pumpkin doughnuts! I love pumpkin!! I would definitely make your oreo layered cake!!!! Pinned the pumpkin dump cake. Pinned the skeleton cupcakes. Cute! These donuts look wonderful! I would like to make your Wicked Witch Cupcakes, they are so cute! Pinned the wicked witch cupcakes. Love this!! So clever! Pinned the pumpkin nutella s’mores cupcake. Yum!! Yummy! These look good. If I won the kitchen aid I’d make your almond joy cupcakes first because I love coconut’ and chocolate…. The first thing I would make are those ADORABLE frankenstein cupcakes. Those are so cute. I am a sucker for anything Halloween themed! On FB I shared the pumpkin cream cheese bread. On FB I shared the turkey cupcakes. I pinned your TOO CUTE pumpkin patch cupcakes. I shared one of my favorite recipes of yours on FB…cookies and cream cupcakes! I pinned your banana snickerdoodle cupcakes, can’t wait to try! I pinned your coconut mango cake! yum! I shared your coconut mango cake! Hey Lizzy ~ Pinned and posted to my FB page the……PUMPKIN doughnuts and went to Amazon to purchase the pan — thanks for the direct to product, cannot wait to try. Would also LOVE baking these up with my new PINK Kitchenaid Mixer (fingers crossed) — thank you for sharing your super SWEET stories — fingers crossed you get a phone call too 😉 !! I would totally make the Carmel Apple Coffee cake! Yum!! I want to make those pumpkin doughnts! Seriously going out to buy that Pan tonight! I pinned the rocky road Cupcakes. They look delicious! 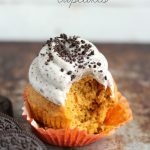 I pinned pumpkin Oreo cupcakes! I pinned the pumpkin patch cupcakes. I love all your cupcake recipes. Hard to decide, but I would make the pumpkin crumb cake. 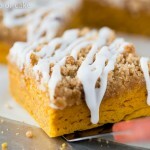 I love pumpkin and crumb cake! I pinned your chocolate strawberry cheesecake cupcakes! I pinned your peanutbutter swirl oreo cupcakes! I would make your pumpkin cream cheese bread, two if my favorite things! Earlier this month, (when you posted it) I made the Pumpkin Dump cake, it was amazing!!! I shared it on our family site on FB……I am going to make it again for Thanksgiving…….. I would for sure like to try the Pumpkin Doughnuts with my new awesome Kitchen aid mixer………I think that is a great recipe to bake them instead of frying…………..thanks for all your recipes!!!!! Just shared the Pumpkin donut recipe on FB………thanks again for your recipes!!!!! I would make your pumpkin dump cake! Or any of your pumpkin desserts because they are so yummy and I love fall! I pinned the cinnamon toast cupcake! I pinned the mm peanut butter cupcake! I pinned th yummy cute ghost cupcake! I pinned the Oreo red velvet! My husband loves this one! Pinned the yummy pumpkin cheesecake cupcake!! Pinned the Carmel Apple cupcake! I must try this one! Yay love this giveaway! Your pumpkin dump cake is a winner! I want to try your witch cupcakes this month! I would make the Witch’s hat cupcakes, my grandkids would just love them. Pumpkin donuts is what I would make first. I love both of these things. I would start with this pumpkin doughnut recipe. I need to get one of those doughnut pans. I pinned your Beef of Broccoli recipe. I’m trying to plan dinner. I pinned coconut Mango cake. I pinned chocolate cookie dough cupcakes. I pinned your Pumpkin Donuts recipe!! I would make your Carmel Apple Coffee Cake! Dreaming about it now! If I win the mixer I would make the PUMPKIN DONUTS first! With Fall in the air, how can you not indulge in a little seasonal treat?? Thank you so much for sharing all your delicious recipes, Lizzy! I just pinned the Cute Reese’s Pieces Turkey Cupcakes!! I just pinned your Chocolate Pistachio Cupcake recipe….Mmmm!! 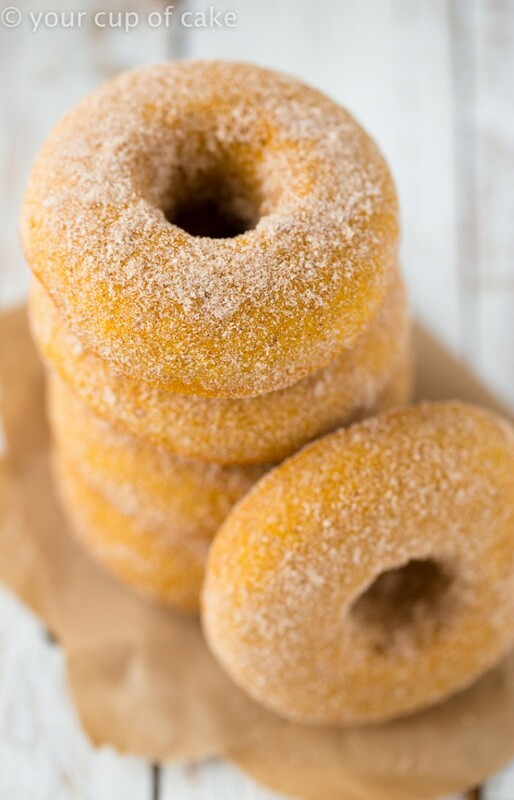 I would definitely have to try making these pumpkin donuts if I won a beautiful kitchenaid!!! I would make the Caramel Apple Coffee Cake…yum! I reposted Easy Oreo Cake on Pinterest! Coconut Mango Cake on Pinterest! I pinned the banana snickerdoodle cupcakes! I pinned the peanut butter chocolate rice crispy treats..
Pinned your Pumpkin Dump Cake recipe and I’m so excited to try it! Shared your Halloween Puppy Chow recipe on Facebook! 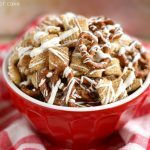 Pinned your recipe for Pumpkin Puppy Chow!!! I would make your pumpkin doughnuts! I would make your chocolate zucchini bundt cake, it looks delicious and I still have zucchini in my garden! I would make the Skeleton cupcakes! I pinned the skeleton cupcakes! Can you tell I’d really love to win that mixer? I would totally make these pumpkin donuts. Yummy! I love this so much!! You are the greatest for doing this! I love seeing all the things you make and wish I was as good at baking as you! pinned these donuts on pintrest! 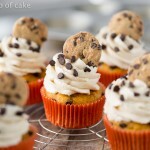 If I will the kitched aid, I will make the pumpkin patch cupcakes! YUm!! mmmm. definitely would make pumpkin nutella muffins to start! pinned your one pot cheesy chicken lemon pasta. pinned the brownie batter cupcakes. pinned the pineapple bundt cake. because pineapple is always a good idea. pinned the pumpkin coffee cake. pinned the red velvet cookie dough cupcakes. I always love to make the oreo whoopie pies and I also love the chocolate chip cookie dough brownies! I pinned the Caramel Apple Coffee Cake. Yum. I pinned the pumpkin dump cake! I pinned the golden oreo cupcakes! i pinned your hot chocolate truffles! I would make a batch of chocolate chip cookies for my husband. Thanks for the chance to enter. I pinned these donuts to my baked donuts. Thanks for the chance to enter. Oh wow! I pinned this recipe right away, (https://www.pinterest.com/pin/483011128764779337/) without even knowing how to enter the giveaway. Of course I’d be glad to win, but I’m even more happy for your 5 year anniversary! Congrats, and I hope you keep posting so that I (and others) can share the love of baking! Mmmm… also pinned https://www.pinterest.com/pin/567523990521708273/! The pumpkin whoopie pies! I’ve never made a whoopie pie before, but it looks so good- I think I’m gonna start getting the ingredients for it sometime this week! With a brand-new mixer, the Mexican hot chocolate cupcakes come to mind. Thanks for the chance, and congrats to the future winner! I Love, and pin EVERYTHING you post but the first thing I would make with a new Kitchenaid Mixer would have to be your Red Velvet 4th of July Cupcakes. I would make the snickers cupcakes ! I pinned Reese’s Pieces Chocolate Chip cookies. I would make the Pumpkin Dump Cake and the Donuts because I like to live dangerously! The first recipe I would make is the Pumpkin Nutella Muffns! The Pumpkin Doughnuts look so delicious! I would definitely make the Pumpkin Cream Cheese Bread! In fact, I’m going to make it whether I win or not. Except I will make it gluten free. I pinned this particular recipe because it looks so good that I want everyone to be able to make it! Thanks for the recipe! I would make the Pumpkin Coffee Cake for sure! Would love to make the pumpkin coffee cake for sure. I pinned the wicked witch cupcakes. I pinned the Reese’s pieces turkey cupcakes. I pinned the Pumpkin Patch cupcakes; they will be perfect for my two daughters’ Girl Scouts troop. I pinned the S’mores Puppy Chow, I made it for a family gathering, and came home empty handed. Delicious!! I pinned the Pumpkin Chocolate Chip Cookies Stuffed with Cream Cheese. I adore pumpkin and cream cheese. Hi Lizzy! I would make the banana snicker doodle cupcakes if I get the kitchen aid! I pinned the Pumpkin Cream Cheese Bread and Muffins. Making the bread tonight! I pinned the snickers cupcakes! I pinned the halloween puppy chow! I pinned the beef and broccoli! I pinned the no bake peanut butter chocolate bars! I pinned the Caramel Apple Coffee Cake! I shared slow cooker beef and broccoli on Facebook! I shared the caramel apple coffee cake! I would make the caramel apple coffe cake with my kitchen aid! I shared slow cooker cheesy artichoke dip on fb! I shared the slow cooker beef and broccoli on fb! I shared the caramel apple coffee cake on Fb! I pinned pumpkin coffee cake! I pinned chocolate nutter butter cupcakes! I pinend halloween puppy chow! I pinned banana snickerdoodle cupcakes! I pinned pumpkin chocolate chip cookies stuffed with cream cheese! I pinned pumpkin heath bar cookies! I pinned andes mint cake! I think I would make the Frankenstein Cupcakes because it is Halloween time and they are so cute! I posted the Pumpkin Cream Cheese Bread on Facebook. It looks so delicious. I would make the Pumpkin doughnuts! I would make the lemon cupcakes with cream cheese frosting. Um, maybe I would make the andes mint ones. I really don’t know what one would be first because you have too many delicious recipes that I love! Congrats of 5 years! Pinned this recipe! These pumpkin donuts look YUMMY! The caramel apple coffee cake is looking pretty tasty right now. Congrats on 5 years and thanks for a fun give away. I’d make your darling witchy legs cupcakes! Happy Halloween! I will make the pumpkin zero.netdonuts! They look WONDERFUL!!! I pinned pumpkin dump cake. Wicked Witch Cupcakes are adorable. I would try making those with the KitchenAid mixer. I pinned the Cute Reese’s Pieces Turkey Cupcakes! I shared pumpkin doughnuts on facebook! I shared Pumpkin Dump Cake on facebook. I shared Cute Reese’s Pieces Turkey Cupcakes on facebook. Definitely the million dollar cinnamon rolls, still a top favorite for anytime of the year! I would make the cute Frankie cupcakes. In fact, I am making them for an Empty Nesters party on Saturday. I’ve already made the eyes and neck bolts. I pin your recipes constantly because the never fail to turn out tasty and beautiful! I pinned the Caramel Apple Coffee Cake. I would make your red velvet cupcakes – I promised a friend these for her birthday. Pinned your Pumpkin Cream Cheese Bread and made it yesterday…Yum! First up would be the caramel apple cupcakes – totally the time of year to make them! Shared the mini Frankenstein and Frankenstein’s bride cupcake recipe on facebook! Shared the spooky skeleton cupcakes on facebook. Shared the peanut butter hot chocolate truffles on facebook. I would first make the pumpkin doughnuts if I won the mixer!! Yum! I would make the wicked witch cupcakes first! I would make the pumpkin dump cake first! I shared your German chocolate cupcakes on Pinterest. I shared your Pumpkin Patch cupcakes on Pinterest. I would love to make the Pumpkin Donuts. I have the pan to do it too!! I pinned the Pumpkin Dump Cake!! I would make these pumpkin doughnuts! I pinned your low fat chocolate chip mini muffins. I would make these pumpkin doughnuts! They looks perfect. I need to get a donut pan, these turned out great! I would make the pumpkin dump cake. Looks delicious! I would make your red velvet cupcakes. These are the best! I shared the Frankenstein Pudding Cups recipe on Fa ebook . I would make the pumpkin dump cake. I pinned to my Pintrest “Fall Baking Board” the Pumpkin Dump Cake and the Pumpkin Patch Cupcakes. Lizzy, I pinned these awesome donuts. The last pan is still in the oven and I could not wait to tell you just how awesome they are! I have already eaten 3 of them……out of this world! If I won the mixer, I would use it to make more of your wonderful recipes. I use them every week! I would totally make these pumpkin doughnuts. Pumpkin everything sounds so good right now! Pinned the Reese’s Pieces Cookies! Pinned the Wicked Witch Cupcakes! Pinned the Monster Whoopie Pies! Pinned the Pumpkin Chocolate Chip cookies that are stuffed with Cream Cheese! Pinned the Pumpkin Dump Cake! I would make these pumpkin donuts or your chocolate raspberry cupcakes if I won the kitchen aid mixer! So delicious! 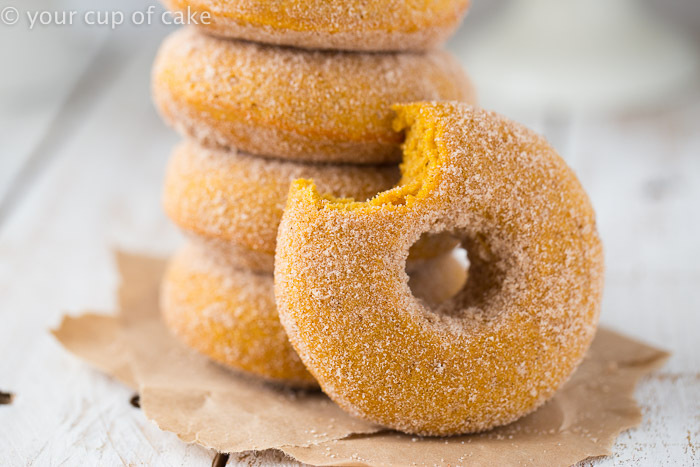 Pin #1 These pumpkin donuts. Excited to make them for the family Halloween party! I shared the Pumpkin Cinnamon Roll Cake on Facebook! I shared the Mr. and Mrs. Mini Frankenstein cupcakes! I shared the Coconut Nutella Cupcakes! It isn’t on the list, but I make your Pumpkin Maple cupcakes every year. They are my absolute favorite!! I would make the pumpkin dump cake! I pinned the s’mores strawberries. 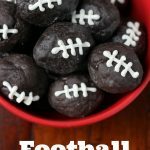 I pinned the peanut butter brownie bites! I pinned the samoa muddy buddies! I pinned the One Pot Thai Peanut Pasta! I pinned the soft eggnog sugar cookies! I pinned the andes mint puppy chow! I pinned the brownie batter cupcakes! I shared the slow cooker cheesy spinach artichoke dip on FB. i shared the taco soup on FB. i shared the crock pot chicken enchilada soup on fb! I would make the million dollar cinnamon rolls! I pinned the taco soup! I pinned the million dollar cinnamon rolls! I pinned the creamy tomato basil pasta with spinach! I pinned Mama’s chicken enchiladas! I pinned 1 pot chicken enchilada pasta! I pinned slow cooker cheesy spinach artichoke dip! I would make the pumpkin cream cheese bread! I pinned the slow cooker beef and broccoli! I pinned the pumpkin cream cheese bread and muffins. I pinned the pumpkin cream cheese dump cake! I pinned the pumpkin chocolate chip cookies stuffed with cream cheese! Pumpkin whoopie pies and these doughnuts! Ooh! If I won the mixer I’d for SURE make your blueberry lemon cupcakes because they’re my FAVE! 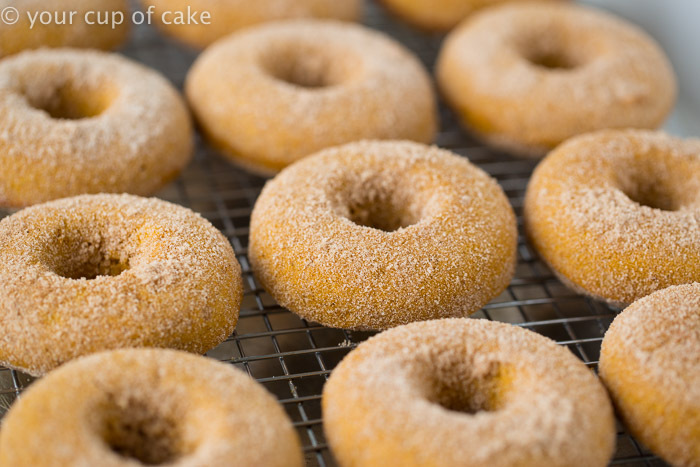 I’d also have to make these donuts because PUMPKIN. I’ve got my eyes set on that rocky road layer cake! I would make your Double Chocolate Reece’s Pieces Cupcakes. I love baking and have always wanted a Kitchen Aid Stand Mixer!! Amazing giveaway! I love your blog! I have been disappointed with many food bloggers, but your recipes never disappoint!! If I was to win, I would love to try your Frankenstein cup cakes. So cute! I would make these Pumpkin Doughnuts!! YUM!! I pinned the lemon cream cupcakes. I would make your wicked witch cupcakes but I have also been eyeing the raspberry lemonade cupcakes for a while now too! I shared the Frankenstein cupcakes via Facebook. The first recipe I would make would be the raspberry hot chocolate cup cakes with marshmallow filling. Your cup cakes are so gorgeous and it makes me jealous because I’ve always wanted to start baking cup cakes like the ones you post. Is make those donuts first. But I also need to get that pan!! I’m soo glad I started following you on instagram! All of your recipes look unreal. I’m a huge fan of peanut butter, so I would probably make the reeses cookies! I’ve been dreaming about your Almond Joy Cupcakes and think it’s hight time I whip up a batch! Entry #2: I pinned the Almond Joy Cupcake, too! Tho, I pinned it to a private board — I hope that doesn’t disqualify my entry…. I would make Coconut Nutella Cupcakes. Cupcakes!!!! Definitely chocolate. Love your basic recipe. It’s a toss between the Pumpkin Dump Cake and the Pumpkin Donuts. The first recipe I would make with this mixer would be the snickers cupcakes that you recently posted! I have never tried a candy bar cupcake, but you post a lot of different ones and I would love to try snickers in cupcake form! So hard to choose but I would love to make your Million Dollar Cinnamon Rolls with my new KitchenAid mixer! I would make the pumpkin doughnuts in the mixer first! They look amazing!! I have a whole list of what I’d make next! 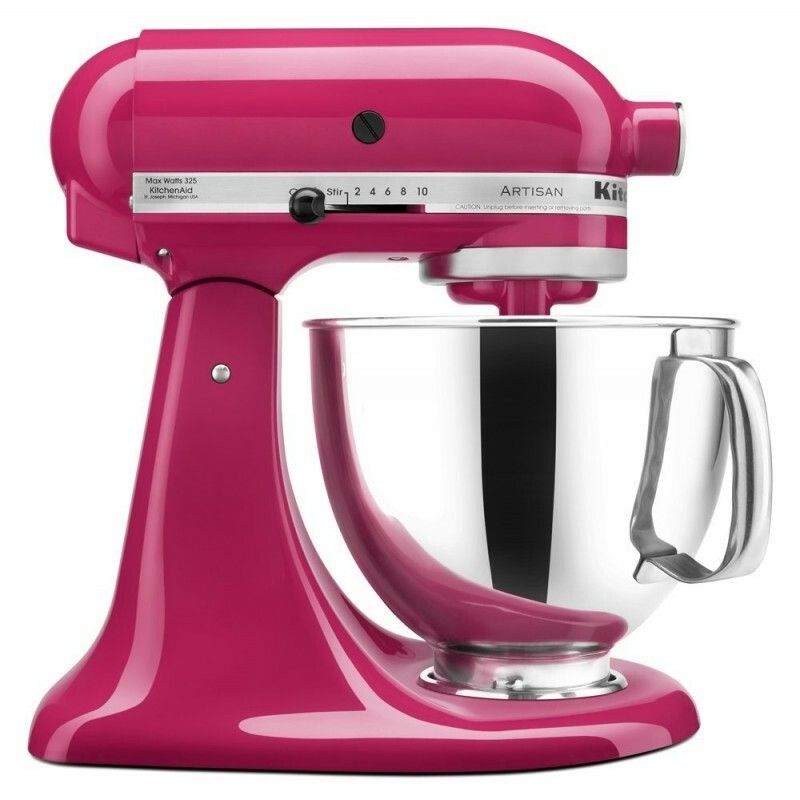 The first thing I would make with this new mixer would be your thin mint cupcakes! I pinned the pumpkin chocolate cookies stuffed with cheesecake! Yum! Oldie but goodie – I’m very excited to try your Oreo Red Velvet Cupcake recipe! They look fantastic! Pinned pumpkin coffee cake! Tis the season! Just pinned your pumpkin cream cheese bread recipe. Just shared this link to the pumpkin donuts on Facebook. I would make your baked pumpkin donuts first! They look delicious!!! These donuts would be near the top of the list! I pinned the recipe for soft eggnog sugar cookies, eggnog is my favorite, mmm!!! Almond Joy cookie bars….oh, you know that got pinned!!! I know my chances are slim, but why not! I adore your photos and I think the dessert that look bomb to make with this bad boy would be your pumpkin cream cheese swilr bread! looks delish. I would make the pumpkin cream cheese bread. i pinned the pumpkin donuts. We love your Costco muffin recipe. I have made it several times as a birthday request!! They freeze great too. I am always up for making another batch. I pinned the pumpkin dump cake. I shared the caramel apple coffee cake on Facebook. Just found you on Instagram and I’m already addicted. Definitely making these today! Your Pumpkin Cinnamon Roll Cake would be next on that beautiful Kitchen Aid mixer. Seriously yum – I’m always looking for good doughnut ideas! Just pinned your Pumpkin Coffee Cake! Just pinned your Monster Whoopie Pies. Just pinned your Almond Lemon Poppy Seed Bundt Cakes! 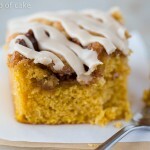 Just pinned your Pumpkin Cinnamon Roll Cake! Just pinned your Cookie Dough Cake! Just pinned your Oreo Cake! I am making your pumpkin snickerdoodle cupcake today!! Wish I had that new KitchenAid to use!! 😀 Thanks for all the great recipes!!!! I would make the pumpkin donuts first if I win the mixer! I would make the Pumpkin Nutella S’mores Cupcakes they look amazing. I would make your pumpkin cream cheese swirl bread with chocolate chips, so yummy! i would make your pumpkin coffee cake!! I pinned your pumpkin doughnut recipe; however I cheated and already made them. TWICE!! They are so delicious, my doughnut connoisseur of a husband even loved them, which is saying a lot!! Simple to make and absolutely delicious! I’d make the caramel apple coffee cake first! I would make your Pumpkin Cream Cheese Dump Cake first thing! I pinned the Pumpkin Cream Cheese Dump Cake recipe. I would make your Pumpkin Coffee Cake. The picture alone is making my mouth water! I would make the pumpkin cream cheese bread!! Looks so good and this time of year I just want pumpkin!! Pumpkin Cream Cheese Bread sounds good! I pinned the pumpkin doughnuts recipe. I also shared the pumpkin doughnuts recipe on Facebook. The first thing I would make is the Pumpkin Cinnamon Roll cake with Maple Glaze! As a matter of fact, I don’t think I can wait…I have to make that ASAP! It looks so good! Recipe for Apple Bread with Streusel Topping…pinned ! Pumpkin Donuts for sure, I just bought a donut pan so I can make my own downuts! Your pumpkin nutella muffins look delicious, have to make those. I would make your Cinnamon roll pumpkin coffee cake! I pinned your adorable Frankenstein Cupcakes! Just pinned your Halloween Puppy Chow. Also pinned your Pumpkin Oreo Cupcakes! Pinned your Pumpkin Heath Bar Cookies. Pinned your PB Chocolate Rice Crispy Treats! Also pinned your M&M Cupcakes with PB Frosting. Just pinned your No Bake PB Chocolate Bars. I would make the Caramel Apple Coffee Cake for sure. It is all I can think about at the moment. I would want to make your Pumpkin Dump Cake with the mixer! Yum! I pinned the pumpkin muffins with cream cheese centers recipe. I also shared the recipe on Facebook. I pinned the taco soup recipe. I would try ALL the cup cakes. I bake a lot for bake sales and charity my very old mixer is not a mix master and my 10 speeds are down to slow and medium. Can’t wait to do as many of the Halloween cup cakes as I can. would like to try pumpkin donuts but do not have right pan. Cup Cakes are my thing and can’t wait to try a few of these ideas. I own a very old Oster mixer that had 10 speeds and now only has 2. Love to bake for others who can’t or don’t have time. would make spider cupcakes. I have a party to go to and would love to take these as pass around dish. I bake a lot for other people and charity events. My Oster mixer is very old and not working very well. THe Reese’s Frankenstein Cupcakes are so darn cute!! I pinned the adorable wicked witch cupcakes. I pinned your delicious pumpkin cream cheese bread. I pinned your cute pumpkin patch cupcakes. I pinned youru RIP tombstone cupcakes. Very cute! Im trying your Skeleton Cupcakes. I would make the pumpkin doughnuts or the cookie dough brownies. Yum! I would totally make these doughnuts first! Pinned Million Dollar Cinnamon Rolls. 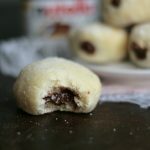 Pinned Low Fat Chocolate Mini Muffins. Pinned Pumpkin Cinnamon Roll Cake with Maple Glaze. Pinned Chocolate Brownie Muddy Buddies. I would definitely make the pumpkin patch cupcakes with the new mixer! First thing I woud make is the skeleton cupcakes. Pumpkin Doughnuts has been pinned. 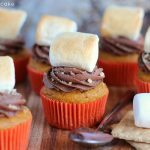 Pumpkin Nutella S’mores Cupcakes pinned. 3 Ingredient Reese’s S’mores Skillet Dip pinned. Reese’s Peanut Butter Cupcakes pinned. Slow Cooker Beef and Broccoli pinned. Lemon Poppy Seed Cupcakes with Strawberry Frosting recipe pinned. I shared your Blueberry Lemon Poppy Seed Cupcakes on my facebook wall. Cute and Easy Frankenstein Cupcakes shared on FB. Wicked witch cupcakes posted on facebook! The mini Mr. & Mrs. Frankenstein cupcakes shared on fb. I would definitely make your pumpkin donuts with a new Kitchen Aid Mixer. I would make a bread. I would make the pumpkin dump cake first. Looks amazing! I would definitely make these pumpkin donuts first! These look AMAZING! YUM! I also pinned the Pumpkin Dump cake which I would DEFINITELY make as well 🙂 This is such an amazing giveaway, I would LOVE to win since I LOVE baking so much!! 🙂 Thanks for the opportunity!! Please enter me!!! I’ve been yearning to make your Cranberry Eggnog bread, so, since the holidays are coming up, I would make that! I would have to go for the carmel apple coffeecake first. At the moment, it sounds wonderful. mmm. I would make the Pumpkin Doughnuts with my new Kitchen Aide Mixer that I am going to win. I pinned pumpkin Dump Cake!! I shared ur pumpkin donut recipe on Facebook and I would make ur pumpkin cream cheese bread first….but only because I would need to buy a donut pan first! Great blog…I love seeing ur posts in my feed! Well with that beautiful machine i would be able to make all your tempting recipes!! Yummy ! 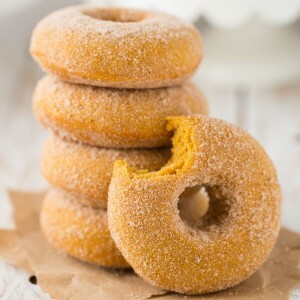 I am a sucker for anything pumpkin, if I were using a new mixer I would definitely be making these donuts first! I’ve never seen a recipe for pumpkin donuts before. Realistically I’d probably have to make three batches because the first two would go “missing.” In my stomach. I would totally make pumpkin donuts! YUM!! Raspberry Lemonade Cupcakes are definitely on my list to bake and its the first thing I would make if I won. What an inspiration! Raspberry Lemonade Cupcakes has been shared on FB! Pinned Raspberry Lemonade Cupcakes to pinterest. I pinned the Chocolate Blackberry Cream Cookies recipe. I shared the Chocolate Blackberry Cream Cookies recipe on Facebook. I pinned the Slow Cooker Cheesy Spinach Artichoke Dip recipe. I pinned the One Pot Cheesy Chicken Lemon Pasta recipe. I’d love to try the skeleton cupcakes! i would definately go with the pumpkin donuts, they are baked and not fried! I would use your mixer to make pumpkin whoopie pies. Love to try out the pumpkin donut. I would make 20 B-day cupcakes for my best friend, because she will turn 20 soon. Your pumpkin donuts are to die for! I need your pan too. Where did you get it? I’d make your Reese’s Pieces Chocolate Chip Cookies! Yum! The pumpkin doughnuts, of course…then a few hundred assorted cupcakes for a teacher appreciation luncheon! I will make your Pumpkin Doughnuts immediately! Definitely going to try the pumpkin donuts! I’ve dreamed of having one of their mixers for years! I would make these pumpkin doughnuts for my nephews. They LOVE doughnuts! I would make cupcakes for my students at school! I pinned, posted and will definitely be trying the Baked Pumpkin Donuts. These sound so good I may even be able to get my very picky DH to try them. I’d make my breastfeeding cookies, I need all the help I can get. I just bought this same pan from Amazon last week! We tried the recipe that it came with right away, but pumpkin doughnuts was the reason why I bought it! Thanks so much for this recipe! If I got the Kitchen Aid mixer, I would definitely make the chocolate chip cupcakes first! I have made them once and they were AMAZING! Your blog has been inspiring for baking and I always go there for fun ideas! I shared your caramel Apple pie on Facebook….going to make this for Thanksgiving. Thanks!!! Hi, Lizzy, I have loved every recipe I have made from your Web site and books. I even got my library to order both books so that others could enjoy them too. My son loves the pink lemonade cupcakes. I loved the wicked witch cupcakes. They were fabulous. Everyone loved them at the Halloween party at church. Thanks for the recipes.you are an inspiration to me. I’d love to make the caramel apple coffee cake. Pumpkin cheese cream cake. Ill send pictures of me making it if I win the mixer! I have made lots of your recipes in the past, right now I have my eye on the pumpkin doughnuts!! I just shared the Pumpkin doughnuts on my FB wall! I love that you share your recipes with us, your readers!! Definitely the caramel apple coffee cake!!! Pinned caramel apple coffee cake!!! I would make the Frankenstein cupcakes for my Kindergarten students and staff! 🙂 🙂 So far they LOVE anything and everything I bake (thanks to your website)! I’d make your Caramel Apple Coffeecake. Yum! I’d make the Easy Oreo Pudding Cake followed closely by the pumpkin donuts! I’d start with making the caramel apple coffee cake… looks amazing! I’d start by making these donuts! They look delicious. I am making the skeleton cupcakes. It would be awesome to win one of these. 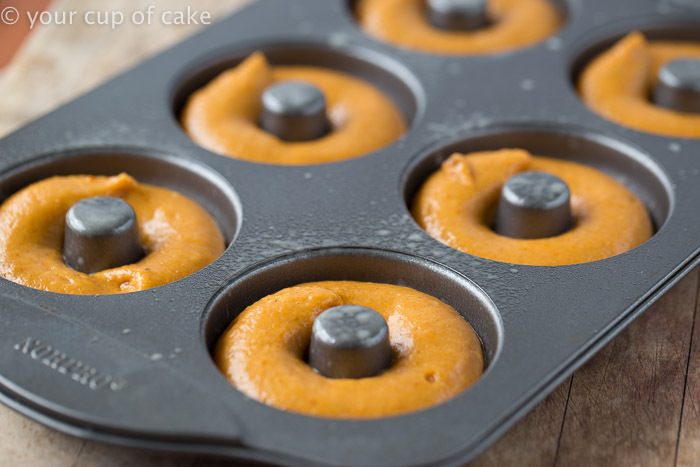 I am going to attempt to make these pumpkin donuts this weekend! They look delicious!!! !